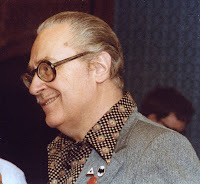 By now most folks know that Forrest J. Ackerman, the ultimate science fiction fan, publisher, author and agent passed away this past Thursday at the grand age of 92. I don’t have a lot of personal anecdotes about Forrest J. Ackerman, but I did have the pleasure of meeting him quite a few years ago at a convention in Kentucky (the photo at the right was taken there). I remember having an animated discussion with him in the hotel lobby about science fiction films, Alien as I recall. He was friendly, approachable and very passionate about movies. I have compiled a list of links to the many tributes and stories about Forrest for those that want to know more. But here I offer up my list of Twelve Fascinating Things You Should Know About Forrest J. Ackerman. Highlights of his Ackermansion collection included: the ring worn by Lugosi in "Dracula," the giant-winged pterodactyl that swooped down for Fay Wray in "King Kong," Lon Chaney's cape from "The Phantom of the Opera" and "Metropolis" director Fritz Lang's monocle. Ackerman had cameos in over 210 films, including bit parts in many monster movies (The Howling, Innocent Blood, Return of the Living Dead Part II), more traditional "imagi-movies" (The Power, The Time Travelers, Future War), spoofs (Amazon Women on the Moon, Attack of the 60 Foot Centerfold), and at least one major music video (Michael Jackson's Thriller). Thus, his Bacon number was 2. He will be missed. After attending hundreds of conventions over the years, I am sure tens of thousands of fans had met and connected with him.